Are you looking for original whippet collars? Than just click to find the most original and unique designs! In this category you can find and buy the nicest beautiful and very original designer custom leather original whippet collars for your dog. All greyhound whippet collars are unique and made from the highest quality Spanish leather and ornaments. All collars are handmade of high quality Spanish leather from Alicante. Superpipapo prefers to work with natural materials whose quality ares tested with its own and other dogs and cats. The Mediterranean, where sun and salt are fanatical enemies of each material, is a great testing environment. This way we get a good picture of the quality and applicability of the used accessories for our original whippet collars. Many of the designs are offered for dogs of all sizes; but especially for greyhounds, whippets, lurchers and other dogs that need a wide collar , I always relate the design to the specific size and proportion of the used materials. Superpipapo designs and manufactures all models itself. You always will find a broad selection of whippet greyhound designs for all for all tastes! If you cannot find anything right now, please visit us again soon! 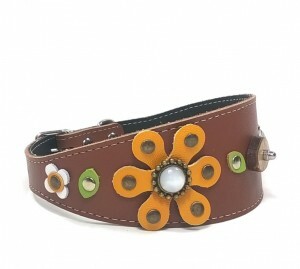 Please don´t forget to order a matching leather lead and bracelet. Make your dog and yourself happy: In Style with Your Pet! Measure the size of the dog’s neck before you order. How to do this you can find in the menu. The greyhound whippet collars in this category are suitable for dogs with a necks size as mentioned below. Also you can see the size of dog collar itself. If you have any doubts or questions, please do not hesitate to contact us using the contact form or by email. We hope you will find the perfect collar design for your greyhound, whippet, lurcher or any other dog you have on which the collar will look good and fit well!